One thing we wanted in our next home was a dining room. In our current house, we have an eat-in kitchen, and while it has worked fine for the past eight years, we've never been able to have people over for dinner easily. In the summertime, we can easily sit outside, but if it rains, we need to reschedule since our 30" round dining room table isn't big enough for more than three people. While an actual dining "room" isn't what we ended up with, we do have a dedicated dining area. I wouldn't call it a room since there are only two actual walls, a third, partial wall made up of the fireplace, and the rest is open to the kitchen. You may remember this image I shared when I talked about our secondhand finds back in January. We picked this dining room set up last summer at an estate sale for a steal. It's shown here with both leaves in the table, but we plan to keep it set up in the smaller position. 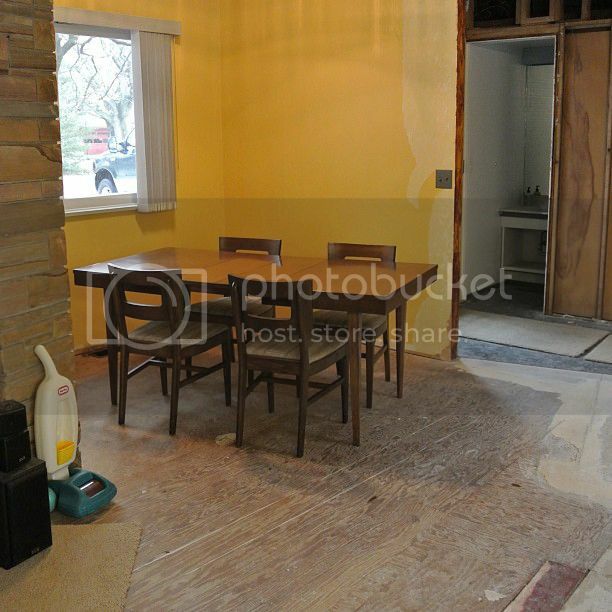 This is the dining area in a pretty raw state - we had taken out the wall already and you can still see that icky little bathroom by the front door. You also see the terrible subfloor we actually ended up replacing so it was level for the new floors. I have plans to recover the dining room chairs - I'm thinking orange or a bold lime green; I may wait until we live there to tackle this project. The wood on both the table and chairs is is pretty good shape, and we don't have plans to refinish at this point. The photo on the left shows exactly how the dining area looked the day we closed. That wall on the right is completely gone and you see the front door as in the photo on the right. It didn't make sense to us to have this area walled-in, and since it was actually added after the original house was built, we didn't feel terrible for taking it down. And instead of a bathroom by the front door, we now have a little area for visitors to take off shoes & hang a coat. Much more usable space for us, as that tiny, gross bathroom had to go! And the icing on the dining area cake? This Orla Kiely wallpaper that will be installed in the coming weeks. I knew I wanted to incorporate wallpaper into this house, but had no where to put it. I kept thinking it should be in our bedroom, but couldn't find anything I absolutely loved for in there, plus I wanted it to be a focal point, and not hidden away in our bedroom. I started looking locally for wallpaper, but nothing seemed retro enough for the house. I finally came across this pattern and couldn't get it out of my head! Greg didn't hate it, and that meant I had better get it before he changed his mind. A couple of searches, and I realized they didn't sell this pattern in the U.S.A., so ended up having it imported from John Lewis in the U.K. for $33! I was shocked on the low cost to have them send this UPS overnight to me - icing on the cake, I tell ya! So, this crazy-awesome pattern full of color and retro-goodness, will be on both walls in our dining room area. The little wall in there is only 42" wide, and the larger one is just shy of 9' wide...so, very little space to actually hang wallpaper, which made this the most affordable spot to put this! And in case you've forgotten about our equally awesome, retro-inspired light, check out the lighting post I did back in March.